Please email at explorekohchang@gmail.com if you are interested in any of our business or land for Sale in the Koh Chang Islands. Great turnkey business opportunity with this seafood restaurant and pub for sale. Located in an up and coming part of one of the island’s most popular areas. Kitchen equipment, 160 seat dining area, all fixtures and fittings. Rental agreement also possible. A unique opportunity to purchase a fully operational Muay Thai Boxing Gym, with on-site accommodation for residential courses and small cafe. A long established wine and spirit business has recently become available for immediate sale. With both wholesale to hotels and restaurants and retail via 3 shops and a small cafe/wine bar, this successful business offers a perfect turnkey opportunity. 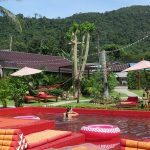 In the heart of Koh Chang’s nightlife area, this busy and popular bar is now up for immediate sale. With the bar itself, a performance area, seating, accommodation and a tattoo shop, this would make an excellent turnkey investment. An existing lease is assumable or up for renegotiation. Located in then main commercial area, this 96 seater restaurant is now for sale in Koh Chang. It’s a perfect turnkey business with fully operational premises ready for immediate takeover. Rolling contract available. An exciting new addition to our portfolio with this successful large bar and restaurant business, with staff and owner accommodation. Located on the main street in a booming part of the island, the offer includes all fixtures and fittings and immediate take-over of the existing contract or opportunity to negotiate a long term with fixed rates. Undeveloped land also included, ideal for expansion with additional bungalows. Located by the sea as part of a new development in one of Koh Chang’s busiest areas, this beach cafe restaurant is now available for immediate sale. With its assumable existing lease, it makes a perfect turnkey opportunity. All fixtures and fittings included. With simply stunning seaviews, this land for sale, just over 2 rai Nor Sor Som Gor title deeds, sits in the south east of Koh Chang. Would suit a developer or equally ideal to build a holiday or retirement villa. Available as 2 plots or sold together. Excellent opportunity to acquire a full Chanote titled 1 Rai seaside plot of land, both a great investment and an ideal spot to build a holiday or retirement house.